The majority of the information about vaccines & vaccinations available to the general public does not come from independent researchers, as most people believe. It comes from heavily lobbied government institutions, via scientists and employees financed by the big pharmaceutical corporations themselves (Figure 1). 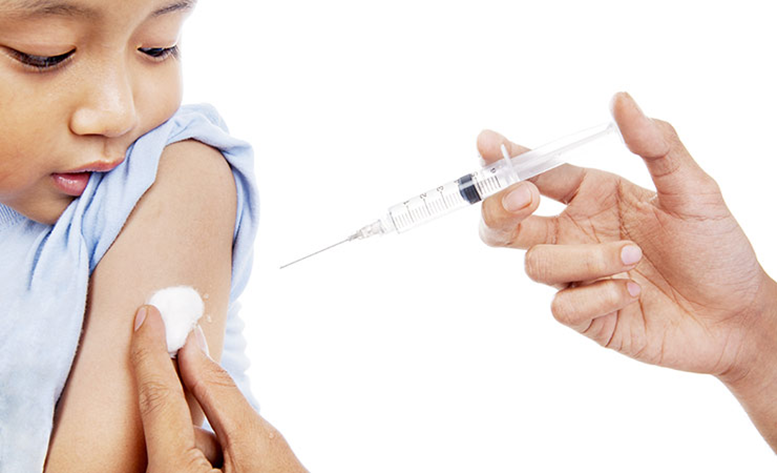 In this article we will take a look at what independent scientific studies are telling us about the safety of modern vaccines and vaccinations. The core message of the one-sided and strongly insisting information coming from the heavily lobbied governmental institutions is altogether very clear; ALL vaccines on the market are absolutely safe and should not be questioned at all. End of story. Vaccines and vaccinations have therefore become the holy cow of the modern times; that thing which you are not allowed to question even when backed up by independent scientific research. Anyone who questions this holy cow is committing blasphemy and should be shunned upon and categorized into the shameful and irresponsible groups of “anti-vaxxers” or “vaccine deniers”. There is something that looks like a witch-hunt going on for people who dare to question the safety of vaccines. Luckily though, for everyone’s sake, the medieval period was over 500 years ago! Thanks to the evolution of consciousness, the internet and consequently the quickening of the time in which information is able to spread, things are changing big time. More people are starting to realize that the information we were taught and insisted upon as children may have been coming from biased sources wanting to keep us dependent on their products. Also, more independent research is being done on the topic by scientists not employed or financed by the pharmaceutical companies. 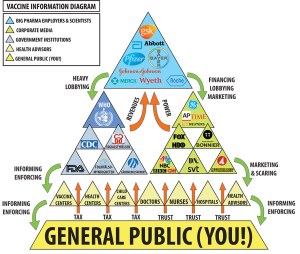 The information in this article is meant to help the growing numbers of open-minded individuals willing to explore information coming from independent and unbiased sources – information that the big pharmaceutical corporations and the heavily lobbied government institutions preferably do not want people to know about. The scientific approach to observe and study things from an objective point of view is worth all the respect it can get. 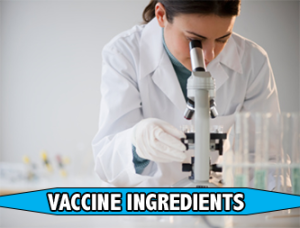 Vaccines contain many ingredients that most people are unaware of. Besides the antigen (the killed bacteria or virus; the weakened disease), which most people know about, there are other ingredients, such as adjuvants and preservatives. Nearly all of the very serious side-effects of vaccines, which are a wide range of autoimmune disorders and a wide range of neurological diseases, are all linked to the adjuvants and preservatives in the vaccines. (1), (2), (3), (4), (5), (6), (7), (8), (9), (10), (11), (12) and (13) . Nearly all modern vaccines contain at least one vaccine adjuvant and some of them also contain preservatives. An adjuvant is an agent/compound added to vaccines to potentiate (make more potent, activate) the immune response. The most common group of adjuvants used in vaccines are aluminum salts (aluminum phosphate, aluminum hydroxide and potassium aluminum sulfate). The most questionable preservative used in vaccines is undoubtedly Thiomersal, which is a form of mercury capable of inducing CNS damage by migrating into the brain by crossing the blood brain barrier (11). Other questionable adjuvants & preservatives used in vaccines are; Monosodium Slutamate (MSG), formaldehyde, Squalene, Paraffin Oil which is a petroleum product used in and adjuvant called Freund’s Incomplete Adjuvant (FIA or IFA). The original titles of the scientific publications are kept. You can click on each title if you wish to directly go to the abstract (scientific summary) of the publication. In 2011 a groundbreaking scientific study directly linked the effect of vaccine adjuvants to a range of autoimmune diseases for the first time ever. Defining a new disease syndrome directly connected to the use of vaccine adjuvants encouraged further research by other scientist who have examined and confirmed the correlations in multiple cases. (2) Sjögren’s syndrome: another facet of the autoimmune/inflammatory syndrome induced by adjuvants (ASIA). A collaborative scientific study from 2014 mainly carried out at the University of Rome in Italy, linked the effect of vaccine adjuvants to a chronic autoimmune disease named Sjögrens syndrome. Sjögrens syndrome causes a chronic imbalance in the moisture-producing glands of the body. Symptoms of Sjögrens syndrome include; dry mouth, dry eyes, dry skin, chronic cough, vaginal dryness, numbness in the arms and legs, tiredness, muscle & joint pains and thyroid problems. Another study, carried out by scientist from University of British Columbia in 2013, presents a large framework of information and data that links aluminum vaccine adjuvants to various neurological disorders. The scientists have linked aluminum’s potential to induce damage at different levels in the Central Nervous System leading to neuronal death, circuit malfunction and ultimately system failure. (4) Aluminum as an adjuvant in Crohn’s disease induction. As the title of this study suggest, this study highlights the potential role of aluminum adjuvant to the induction of Crohn’s disease. Crohn’s disease is a type of inflammatory bowel disease (IBD), which seems to be on an almost epidemic rise in our society today. (5) Adverse events following immunization with vaccines containing adjuvants. In a cross-sectional study carried at the Rheumatology and Immunology Department in a hospital associated with the University of Guadalajara in Mexico, 120 immunized patients were closely monitored to identify the frequencies of post-vaccination clinical syndromes such as autoimmune/inflammatory adverse events that may be induced by adjuvants. The result of the study show data on how vaccines containing adjuvants indeed can bring an increased risk of autoimmune/inflammatory adverse effects. (6) Aluminum hydroxide injections lead to motor deficits and motor neuron degeneration. In this study scientists show that aluminum hydroxide injections lead to neuron degeneration causing various motor deficits just as the title of the study concludes. (7) Aluminum vaccine adjuvants: are they safe? In yet another study carried out by Neural Dynamics Research Group at the Department of Ophthalmology and Visual Sciences in the University of British Columbia, scientists strongly question the widely accepted notion that aluminum in vaccines are safe. They present experimental research that clearly shows how aluminum adjuvants have a potential to induce serious immunological disorders in humans such as autoimmunity, long-term brain inflammation and further severe neurological complications. (8) Biopersistence and systemic distribution of intramuscularly injected particles: what impact on long-term tolerability of alum adjuvants? Research carried out by french scientists link the use of aluminum adjuvants to; diffuse myalgia, chronic exhaustion and cognitive dysfunction. Unfortunately though, the full text article is still only available in french. (9) Human papilloma virus vaccine and primary ovarian failure: another facet of the autoimmune/inflammatory syndrome induced by adjuvants. In a study published in American Journal of Reproductive Immunology, evidence is presented that the HPV vaccine has the potential to trigger a life-disabling autoimmune conditions such as ovarian failure. (10) Aluminum in the central nervous system (CNS): toxicity in humans and animals, vaccine adjuvants, and autoimmunity. This study examines the neurotoxicity of aluminum in humans and animals under various conditions. The study highlights that aluminum exposure in adults can lead to to age-related neurological deficits resembling Alzheimer’s disease. And in young children, a highly significant correlation seems to exists between the number of aluminum-adjuvanted vaccines and the rate of autism spectrum disorders (ASD’s). (11) Mercury neurotoxicity: mechanisms of blood-brain barrier transport. A scientific study published in a peer reviewed journal (just as all 10 above!) named Neuroscience & Biobehavioral, shows how methylmercury (MeHg) is capable of inducing damage in the Central Nervous System (CNS) through migration into the brain by crossing the blood brain barrier. MeHg is the same form of mercury that occurs in the preservative Thiomersal. (12) Do aluminum vaccine adjuvants contribute to the rising prevalence of autism? As the title of this scientific study suggests, it is exploring if vaccine adjuvants may have a direct role in the increasing occurrence of Autism Spectrum Disorders (ASD’s) among the general public. The results show that children from countries with the highest ASD prevalence appear to have the highest exposure to aluminum from vaccines. The increase in exposure to aluminum adjuvants significantly correlates with the increase in ASD prevalence in the United States observed over the last two decades. Also a significant correlation exists between the amounts of aluminum administered to preschool children and the current prevalence of ASD in seven western countries, particularly at 3-4 months of age. The results show that there may be a correlation between aluminum in vaccines and rise of ASD. (13) Are there negative CNS impacts of aluminum adjuvants used in vaccines and immunotherapy? This study reviews existing literature on aluminum neurotoxicity and questions the use of aluminum salts as vaccine adjuvants because it concludes that aluminum not only has a direct toxic effect on the nervous system, but also a potential ability to impact & trigger autoimmunity. The scientists raise concerns about the increasing use of aluminum salts as vaccine adjuvants because of its ability to trigger autoimmune & inflammatory responses, change gene expression and affect the Central Nervous System (CNS) at every level. How and where did I find all this information ? No I did not learn it all from a conspiracy documentary on the internet. The first time I ever heard about adjuvants was when I got employed as Product Manager at Isconova, a quite small Swedish vaccine adjuvant company in Uppsala, the same university town were I few years earlier got my Master of Science degree in Biochemistry. Even after 5 years of university studies within biochemistry and an additional 2 years of work experience I had never heard the word “adjuvant” or knew that vaccines can contain preservatives . So don’t feel bad if you never heard about vaccine adjuvants & preservatives before. Regardless if you have an academic background or not, we are all subjected to heavily biased information via heavily lobbied government institutions, education literature and the corporate mainstream media. I worked for Isconova for about two years before I decided to quit. I never went back to the pharmaceutical & biotech industry because I did not feel good about giving my energy to an industry with such questionable ethics and morals. After all; I studied biochemistry with the intention to contribute to healthcare, but as I later discovered; the pharmaceutical industry was all sick-care, and had not much to do with actual healthcare. 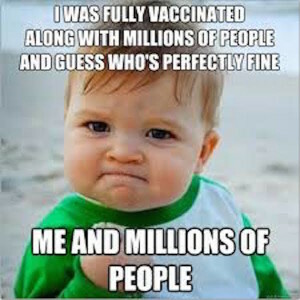 Most people who strongly feel that vaccinations in the governmental vaccine program are safe, are innocently and rightfully doing so because (1) they have personally not experienced any severe conditions after their vaccine injections and (2) we are usually deeply unaware that we are being systematically exposed to one-sided information. However, as you can see in the independent scientific research presented above, autoimmune conditions and disorders absolutely dominate the negative effects linked to vaccine adjuvants. Autoimmune conditions and disorders such as Inflammatory Bowel Disease (IBD), Sjögrens syndrome and various allergies are not easily or quickly detectable because they are multifaceted syndromes with many different symptoms which altogether are complex to correlate and diagnosed. These syndromes will definitely not fully develop & be diagnosed within days, weeks, months or even years after a received vaccine injection. So before we conclude that we are all “perfectly fine” even though we got all the vaccines in the vaccination programs, we need to ask ourselves if we are, or will be, suffering from any of the 20-30 autoimmune conditions that are so difficult to diagnose. Conditions such as allergies, IBD’s or any other of the very common syndromes that have been on an near to epidemic rise in modern times. May this information & collection of research help you to get more clarity regarding your own and our collective health condition on planet earth.